Your June Recycle Right Newsletter is here! You should soon be receiving your 2014/15 Recycling Calendar. Your calendar is an important resource and should be kept on your fridge and referred to regularly to help you to Recycle Right. For a more comprehensive A-Z list see the Recycle Right website at recycleright.net.au or download the Recycle Right App from the App Store or Google Play. Please place your old calendar in your yellow-topped bin to be recycled. The RRRC recently had a visit from the ladies of the Red Hat Society. The ladies enjoyed learning about the SMRCâ€™s resource recovery processes, and also visiting the RRRC community vegetable garden and recycled art sculptures. They were also keen to take home the Recycle Right message, to try out the compostable bin liner samples they were provided with and to promote waste minimisation in their communities. On Sunday the 15th of June SMRC staff and volunteers through the Community Advisory Group along with the Friends of Ken Hurst Park, joined to plant trees in Ken Hurst Park, adjacent to the RRRC. Approximately 30 people turned out and together we planted 250 trees in 2 hours. A big thanks to Chris and Julie, Taryn and Mick â€“ your efforts are very much appreciated by the SMRC and the Friends of Ken Hurst Park. Participants gathered in the Meeting Room at the RRRC after the tree planting to enjoy some lunch, which included frittata made from vegetables that came from the RRRC garden. Why not join in the Garage Sale Trail and have a sale on Saturday the 25th October! Visit www.garagesaletrail.com.au for more information about Garage Sale Trail and how you can get involved. 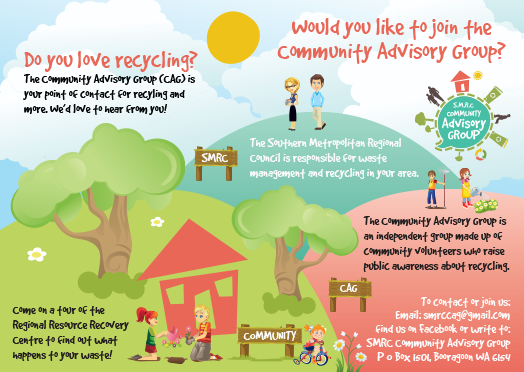 Give us feedback about your waste calendar and how you would like to receive your information about recycling. In accordance with SMRCâ€™s Biofilter Management Plan and Biofilter Refurbishment Plan, a biofilter media inspection and refurbishment program commenced in June. Biofilter 1 cell 3 was the first unit to be inspected. The cell media was inspected and a small section of the media support grates were replaced as was the media and the cell was returned to service approximately 2 weeks after commencement. We anticipate that the entire program will be completed by end of September 2014. Photo: Air diffuser cone inside the biofilter. Commencing on World Environment Day and running for 3 days, the City of Cockburn together with Recycle Right, ran a stall at Phoenix Shopping Centre, aiming to engage the community and improve recycling rates in the home. The community was very engaged, with many already separating out recyclables, with everyone wanting to learn more and keen to improve. Concerned about waste paper? Fed up with bulky, hard to recycle directories in your Material Recovery Facility? The service cancels the delivery of one or both (Yellow and White) directories for five years at an address. By using www.directoryselect.com.au or calling 1800 008 292, you can choose which books you would like to receive and not receive. If youâ€™re a business with more than 20 old books, you can get free recycling advice or arrange for the books to be picked up by calling Visy Recycling on 1300 368 479. In 2010-11 research showed 98% of Australians surveyed said they recycled (83%) or reused (15%) their books. There are also tools available on the website for Strata/Body Corporates to use in order to inform residents of multi unit dwellings about how to opt out. For more information visit Directory Select. The Western Metropolitan Regional Council (WMRC) is encouraging local households, businesses and schools to accept the Plastic Free July Challenge. The challenge is quite simple: attempt to consume no single-use plastic during July. Single-use plastic is anything that is intended to be used once, then thrown away. If all single-use plastic sounds a bit daunting, just try the â€œbig fourâ€ single-use plastic items, which are plastic bags, plastic cups, plastic straws and plastic containers.